that fill us with gratitude, and that truly make the holiday season so joyful. Growing up, my family embraced our Scandinavian roots during the holidays. For Thanksgiving dinner my mom always whipped up her Minnesota wild rice and mushroom side dish, which paired oh-so-perfectly with turkey, mashed potatoes and gravy. (As a kid, I’d mush it all together in a big savory pile, which didn’t look terribly appetizing, now that I’m looking back.) And, come December, my dad’s Swedish colleague would make a giant pot of glögg, and send him home with a bottle of the warm, spiced elixir for us to enjoy in the evenings. This year, I’m adding a new Scandinavian food tradition to the mix—lefse-making. Decades ago, my Nana Sue would make the Norwegian flatbread with leftover potatoes from Sunday dinner. When she and her sister-in-law would make a batch, it was always a special treat, she tells me. 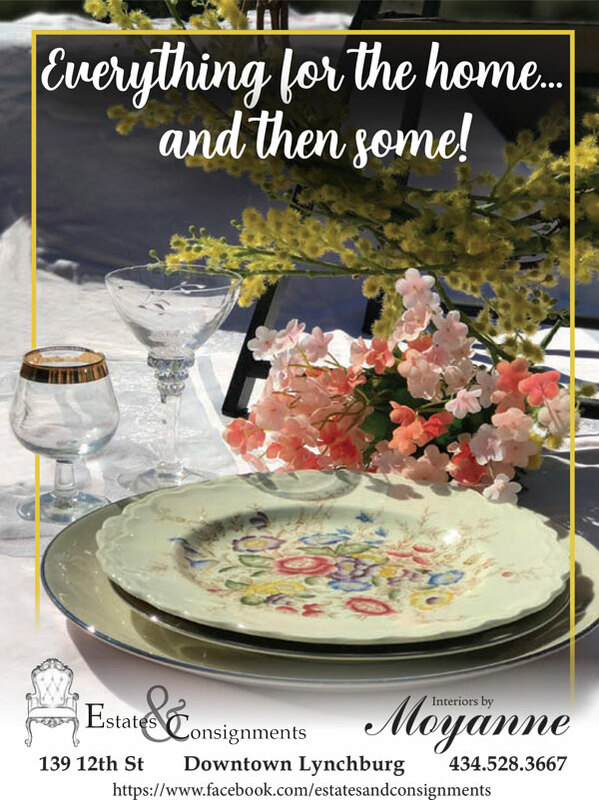 I’m excited to welcome back the tradition of lefse-making this holiday season, as Nana Sue, my mom and I will make it together for the first time at Thanksgiving. After all, what are the holidays without the food that brings us together as a family? Pour the beer into a large pot. Squeeze the oranges, adding their juice and rinds to the beer. Tie the spices (cloves and cardamom seeds) in a cheesecloth and add them into the beer, along with the cinnamon sticks and raisins. Cover the pot and let it simmer for 90 minutes. You don’t want to liquid to cook away, so check the pot every 20 minutes or so, and add a little more beer or water to the pot. Remove the orange rinds after 90 minutes. Add the wine and sugar, letting the liquid simmer (not boil) covered for at least 2 hours. Taste the liquid and add more sugar, if needed. Remove the cinnamon sticks and let the glögg stand overnight (with the spices tied in cheesecloth). The next day, remove the cheesecloth and raisins. Heat up (not boil) the glögg and taste. Add Aquavit (or vodka) according to your taste. To serve: Add a few blanched almonds and raisins in the bottom of a small mug. Pour warm glögg over and serve. Since I was a little girl, this side dish has been served at every holiday meal. It’s important to use actual long-grain wild rice, most of which is grown in Minnesota’s lake and river paddies. You can usually find it in the bulk section at the grocery store, or you can order it online through sites like lundsandbyerlys.com. This nutrient-dense rice is chock-full of all sorts of vitamins and antioxidants—and it’s gluten-free and low-calorie, to boot! If you are sick of the traditional side dish staples, mix it up this year and add this versatile side, which pairs well with turkey and gamey meats. In a deep pot with lid, sauté the onions and mushrooms in butter for 10 minutes, stirring occasionally until onions are translucent and the mushrooms have softened. Add the wild rice and broth, and bring to a boil while covered. Turn down heat to a simmer for approximately 60 to 90 minutes, or until the rice is tender. potato dough. If serving with dinner, spread butter on the lefse. Or, as a dessert snack, sprinkle it with brown sugar or serve with jam, peanut butter or chocolate hazelnut spread. Kids and adults alike will enjoy this delicate and tasty flatbread, a fun alternative to a ho-hum dinner roll. Mix the cooked potatoes, cream, unsalted butter and salt together in a bowl, kneading the mixture so there are no lumps. Cover and chill overnight in the refrigerator. The next day, combine the potato mixture with flour, adding a 1/2 cup of flour at a time and kneading it into the potato mixture. (If the dough feels too sticky to work with, add more flour.) Form dough into golf ball-sized balls for small lefse (yields 36) or larger balls (yields 18), depending on your preference. 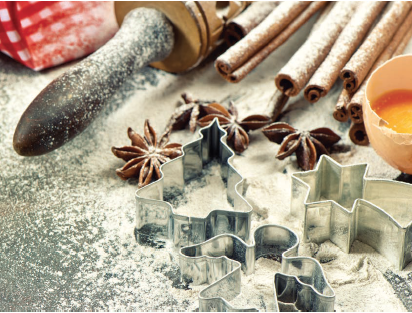 Dust your surface and rolling pin with flour. Roll dough ball into flour, and using the palm of your hand to press it down on the counter into a disk. Using the rolling pin, roll out the dough into nice, thin circles. Heat non-stick griddle or frying pan to medium-high, and fry lefse 45 seconds to 1 minute on each side, until it bubbles and browns. (There’s no need to grease the frying pan; you can add some cooking spray to keep the pan slick, if it gets grubby from flour and dough as you move through the process.) When finished “baking” your lefse, layer each flatbread in a clean dish towel to keep them warm and moist. 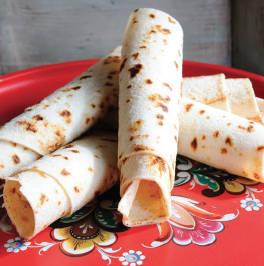 Storage: Lefse is best eaten fresh, but you can store it in your refrigerator and freezer for eating at a later date. To refrigerate, layer in plastic wrap to keep it fresh for a few days. To freeze, fold the lefse in quarters and wrap in plastic wrap.